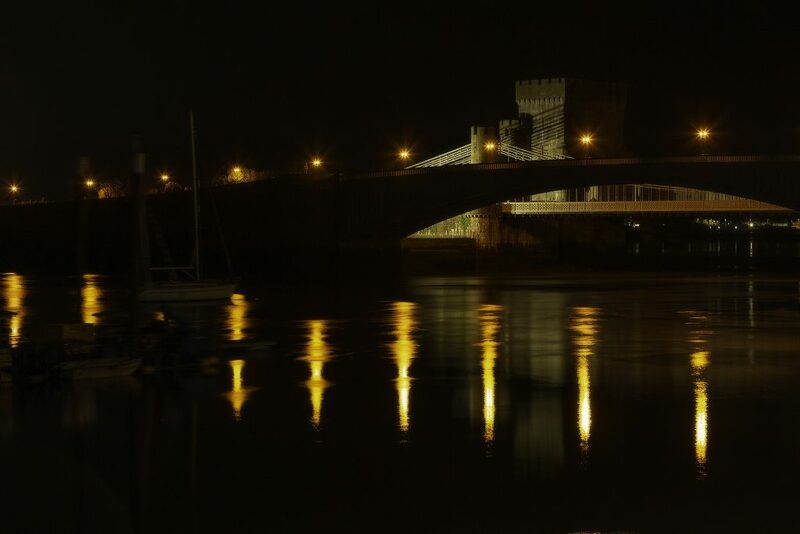 After the January weather related disappointment of having the St Asaph roving academy evening cancelled, twice, due to snow and ice, it was great to have a clear and almost balmy evening in the old walled market town of Conwy. The almost obligatory fish and chip supper at The Archway (highly recommended by the way) set us up for an evening of low light photography around the old town walls, picturesque quayside and bridge over the river. 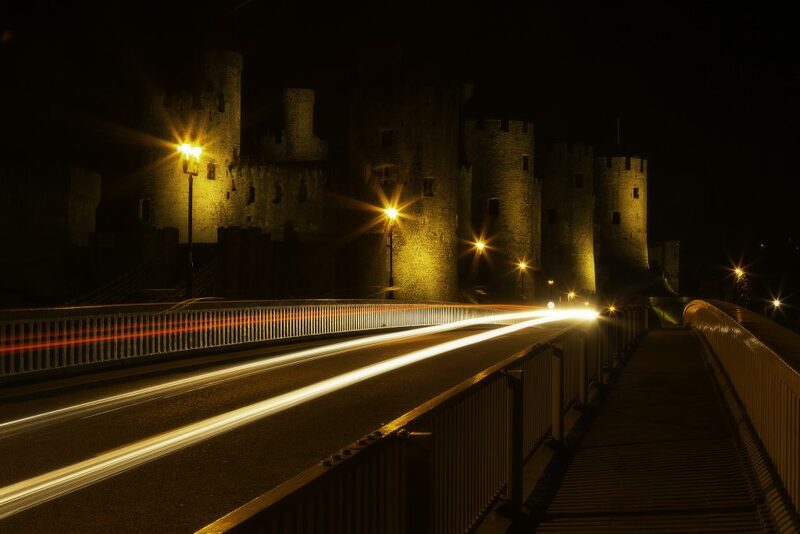 The town boast a magnificent castle that was built on the orders of Edward the First (of England) between 1283 and 1289 as part of his conquest of Wales. Given their age, the walls and castle remain in excellent condition and provide a great backdrop, particularly at night when illuminated. A little-known fact about the town is that those born within the town walls are known as “Jackdaws” after the birds living on the walls there. The approach to the town, from the east, is across a road bridge which is now partially by-passed by the first immersed tunnel to be built in Britain; in addition, there is a railway bridge built by Robert Stephenson as well as the suspension bridge built by Thomas Telford, now only open to pedestrians. 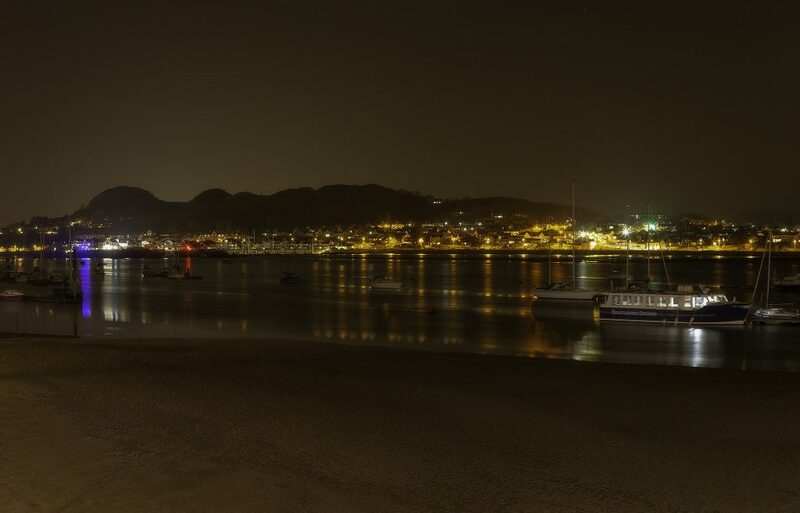 The town faces Deganwy on the east side of the river Conwy and has Conwy mountain as a backdrop. Enough of the history! Photography started in earnest as darkness fell around 7:30, and the water level in the river was low, which left some of the potential for cross river reflections to be for another day. 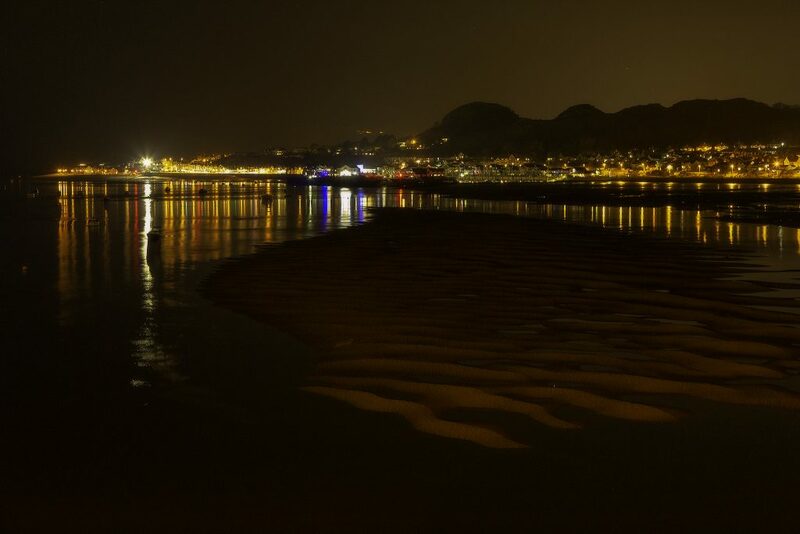 However, there were great opportunities for shots of the multitude of lights from Deganwy and the bridge. 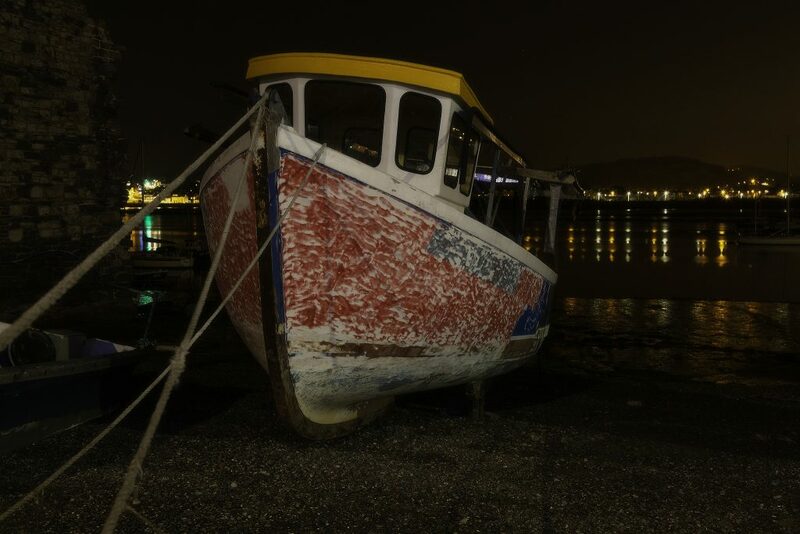 The old quayside, which remains a working site, has a multitude of photographic opportunities with crab and lobster pots, ropes, floats and other fishing paraphernalia as well as leisure craft, all of which offer plenty to occupy an hour – or two! We then moved on to the bridge, where long-exposure traffic trails were the objective. 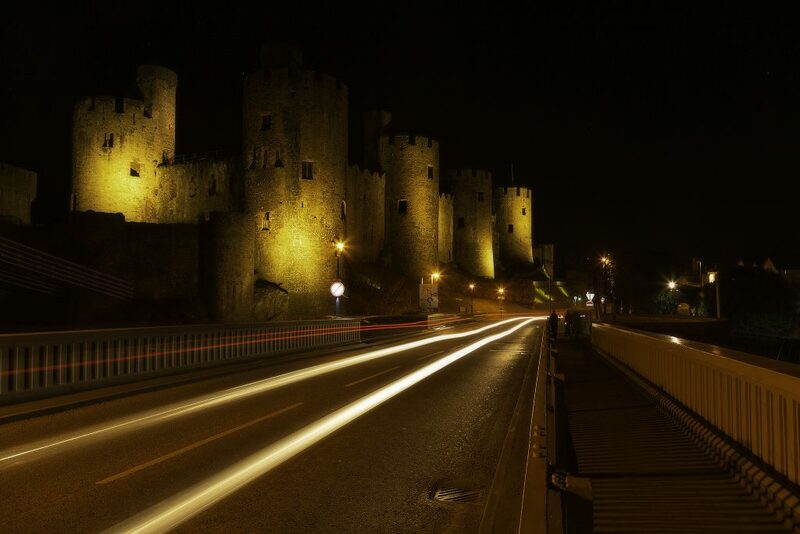 We were thwarted by a distinct lack of traffic, probably due to the new A55, which now passes “under” the river, but the occasional cars and a bus provided material, enhanced by the backdrop of the illuminated castle. The evening passed by in a flash (no pun intended) and as we were packing up there was a loud crunching sound; a camera and lens dropped from a tripod onto the ground. The lens separated from the camera body and looked an extremely sorry sight. It is only mentioned as a huge reminder to everyone to hang onto gear when changing lenses, removing from tripods etc. Cameras and lenses are fragile as well as expensive, and do not bounce! We can only hope that a repair is possible or that insurance will take care of the damage. Despite the mishap, and up to that point, it seems everyone had a good evening, and for that our thanks must go to Eifion for his invaluable support and advice as well as to Lee for the impeccable organisation. A comment made more than once was that photography after dark and alone was a daunting prospect, potentially dangerous even. Taking part in a group all but eliminated the “risk” element as well as providing conversation and company; for me that sums up a large part of what Welshot is all about. Thank you Welshot! That was a really interesting read and great photographs, Simon. I know the Sound of a camera and tripod hitting the concrete only too well when shooting one night in Liverpool a few years ago on a Night Photography class, I forgot that the remote Control cable was attached and walked through it. Ouch! Still, at least it wasn’t the camera belonging to the person next to me, which is what I had thought at first! Imagine! Second lesson learnt that night – Insure your camera! (That was before I joined Welshot obviously )!